They say it must be nice to stay in bed all day. Really? Have they never wanted to do more? When you have no choice it’s very different. One of our loyal Trabasaxons has recently written a post giving fantastic hints and tips for people who have to spend a lot of time in bed. Danni wrote the post Perfecting Bed Life earlier this month and this post is inspired by her wonderful work with a few added tips of our own. Living with M.E. has meant Danni, in her own words, has ‘spent nearly every moment’ in bed for the past few months. Despite this she’s adapted and her post on how to make the best of managing your life from bed is extremely inspiring and we couldn’t help but highlight and share some of her top tips. Danni highlights a wide range of valuable products and ideas which can make living from bed a little easier. Getting used to an adapting to living from bed is difficult but here are a few tips that could be considered essential to your new routine and lifestyle. 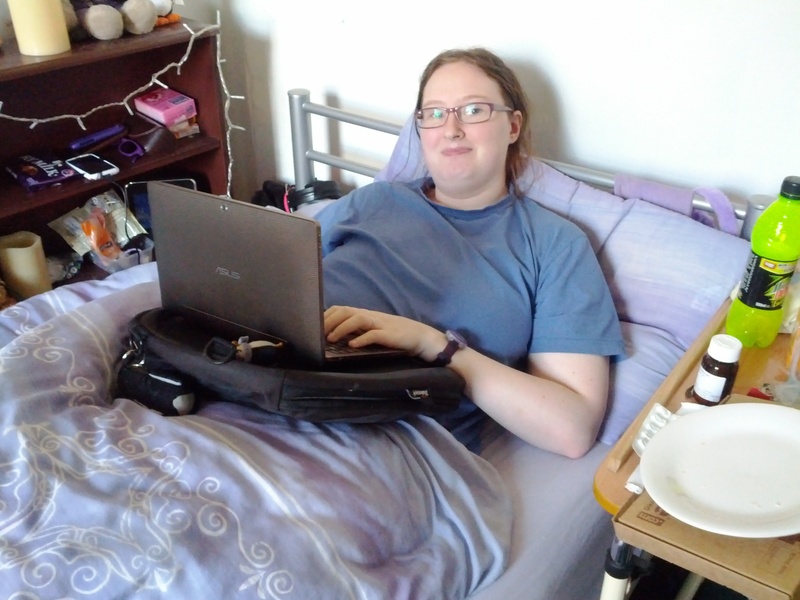 Danni recommends investing in an over-bed table to make accessing things you need regularly easier. It’s also helpful for watching and using multimedia devices up close. An over-bed table falls short when sitting up becomes an issue and Danni suggests using your Trabasack in this case and a Trabasack is also an affordable alternative if you’re not sure about the space for an over-bed table in your home. Danni also recommends another of our favourite products – the Hydrant, for drinking from bed as it stops the risk of any spills and they can be bought in large sizes. Replacement ends are needed when the device has been used regularly for a number of months. Hydrants are now used by the NHS to help ensure patients are kept hydrated in hospitals. We also like the handsteady drinking cup that allows you tilt the cup right back using the rotating handle. The handSteady drinking aid stays upright, is easy to tilt and always keeps steady. Click this image for more info. Another simple yet essential tip from Danni is her suggestion that you should have as much stuff as you possibly can within reach. It’s not always possible or appropriate to call someone to get stuff for you and maintains a degree of independence. This could mean having shelves installed near your bed or putting key items on the bed next to you where there’s space. Bedside tables are ideal for storing snacks and medication. Another alternative that we featured in a previous blog is a Telestik grabber or Handi reacher to extend your reach and access things that have dropped to the floor. From a personal perspective it makes sense to keep the room as nice as you possibly can. Danni highlights that some people need rooms to be non-stimulating but others can benefit from nice pictures or being able to see out of the window. Another essential key point is to remember to keep moving as much as you can. It is very easy to slip into the habit of staying still once you’re living from bed but as Danni warns, bed sores are a genuine risk. If you can move yourself it’s best to try to do so as much as you can, whether it’s wriggling, rolling or whatever is best for your circumstances. If you’re unable to do this then it’s essential you have help to move position every two hours or so. Some people use sliding sheets or towels to help them roll and move in bed with the help of another person. Bed sores or to use their technical name pressure sores develop when a large amount of pressure is applied to an area of skin over a short period of time. They can become extremely painful and hard to manage and therefore keeping active from bed, in any way you can, really is essential. As Danni also mentions, a low cost idea is using a sheepskin can help with making the bed softer. If you do not move much and are spending long periods in bed it would be good to also ask your occupational therapist about a special mattress or even an inflating one. Our final essential point is to ensure you have an effective way of contacting your carers. This could be via a telephone, computer or if you live alone a panic button or cord. Wireless doorbells are another way of connecting with someone who may be in another room when you need support. Here we’re once again taking inspiration for Danni and covering some of the ways to make your long-term stay in bed as comfortable as possible. Comfort is one of your top priorities and as Danni says ‘most clothes are not comfortable for lying in’ and there are clothes which are better. It’s understandable you may not always want to wear pyjamas and t-shirts and leggings make a good combo. Danni also makes the great point of saying a cardigan or zip-up hoodie is a better option than a jumper as it’s easier to take on and off. Cushions and pillows are also great for comfort and u-shaped body pillows, often marketed as maternity products, can be a great option. They can be very supportive and can help you sit up if you find it difficult. The types of cushion and pillow which suit you will be very personal and you may want to try out different types. Danni also highlights her trademark microwaveable penguins as great for keeping warm if you have difficulty moderating your body temperature. They can also ease chronic pain and aches of different kinds and if you don’t fancy a penguin there are plenty of microwaveable body wraps and other animal characters too. Your personal care is a very private and personal affair but there may be elements you need help and support with, especially if you’re unable to get to the bathroom. Bed baths are great but as Danni says if it’s not always practical then bath in bed wipes are a good alternative. They’re large and designed for getting fully washed in bed – they also avoid the need to be dried afterwards. Hair can be another issue, Danni went for the chop to make managing easier but there are options for keeping your hair clean. Dry shampoo works for a few days but isn’t a long-term solution. exist too to avoid excess grease or you can buy a shampoo cap. An inflatable basin is the best option for proper hair washing, along with lots of towels to ensure you don’t soak your bed right through. A waterproof mattress protector is a complete essential and guarantees your mattress doesn’t need replacing regularly. Toileting is another personal care issue you’ll need to handle and as Danni says for most people it’ll mean using a bedpan or incontinence pads. It’s not the most pleasant of issues but it is something you have to deal with. If you can manage a commode then this is a good option and there are personal toilets such as the Uriwell range which can be useful. There are a range of different bedpans on the market and as with the pillows it’s worth finding out which is best to suit your needs. Keeping entertained and motivated is one of the main concerns if you’re living from bed. Mental stimulation may not always be something you need dependent on your illness but keeping entertained is key to avoiding further problems such as depression. Danni highlights a laptop, tablet or internet connected phone as a hugely valuable resource as it gives you access to social networks, games and you can stream television and films. What works best for you will depend on the level of fine motor skills you have maintained and if you need further support your Trabasack and Media Mount combined can keep your tablet or smartphone perfectly in position. A tablet is a great idea. You can watch films, talk to friends via social media and email and listen to music using something lightweight like a kindle fire . if you like to read as you can access the Kindle app and read to your heart’s content when you’re well enough. If you are reading a traditional book there is the Page Keeper that can help keep track and hold your page open. Danni also recommends the uniquely designed SleepPhones as they’re designed to be worn in bed so extra comfortable. Additional extra can include everything from an eye mask to make sleep even more restful to fans to keep you cool in summer, which can be no mean feat when living from bed. Other gadgets you could consider include remote controlled lights and electric switches and this makes another job which you may have relied on others for something you can do yourself. Please share any tips or gadgets that you find useful or any comments that you would like to share below. Oh, I forgot bras! This is probably more for those of us who are in and out of bed like me. Ordinary bras started to hurt like hell some years ago, especially when I was lying down. Lying down makes your diaphragm expand, which means that your bra suddenly feels like someone’s wrapped a wire around your ribs and pulled. And that’s before we get to underwires. My choice was no bra at all, which wasn’t actually that comfortable and I hated how it looked if I had to get up and see people, or to faff around taking off my clothes, putting on a moderately uncomfortable bra, and then putting my top back on, every time I wanted to go out or have people over. I did find a solution in the end. Look into maternity sleep bras, specifically the Bravado Body Silk. The whole thing is stretchy, it’s comfortable lying down or standing up, and it actually gives pretty decent support. As well as daytime naps, I’ve occasionally slept in them at night when I’ve had bad breast pain. I’m not mad on microwaveable heat pads, and hot water bottles are too risky. I use an electric heat pad, and when my last one died, splashed out a bit more and got a nice one from Beurer with a fluffy cover and a more flexible pad. It’s good for warming up my feet if tucked down the bed, or put behind my back for back pain. Some have a cable that gets hot, so check that. The Beurer ones don’t. Also avoid anything with a dark colour, as it tends to stain your bedding. I also have a big fluffy electric heated throw, which I absolutely adore. My ME’s not quite so bad these days, I don’t spend my entire time in bed, but I do spend most of the day in bed or lurking on the sofa, and I now spend half the week living at my boyfriend’s. So we bought a spare heated throw for his flat. Both get a huge amount of use, and the cat adores them. My temperature is very variable, and in particular I often get freezing cold, especially when I’m exhausted. Make sure you get one that’s a decent size, around 130cm x 180cm. Some of the ones on the market are smaller. I’m quite small, and find that this is big enough to cocoon myself thoroughly, or to spread it over myself and my boyfriend while we’re watching TV. Sometimes I manage to lie on top of the bedclothes with the heated throw on top of me, and it’s really cheering, as I don’t feel like I’m stuck in bed in the same way. I have my laptop on an overbed table, so the screen is at a decent distance, and then a wireless keyboard, as the overbed table is only really accessible when I’m sitting up. I also have a 7″ tablet, which has a nice little stand. Good bedside storage is essential, since as mentioned above you will need to keep a lot of things near you. I like to use a metal water bottle, as I tend to drop it or knock it over, and this way there are no breakages or spillages. I ended up with a couple, and bought them different coloured caps to make it easier to keep track of which one was last washed. My support workers also record that sort of thing on apps we use on the tablet. My friend is not going to be doing a long term stay in bed but a short stay cause of some surgery but anything is helpful because she is deaf/blind. A lot what you mention she cant use but a lot she can and I thank you for putting all this in my mind. Your page will be shared with the other caregiver too. Thank You again. I just wanted to write that I Loved this post because I am also bedridden at the moment and only able to go in my wheelchair 2 or 3 hours per week usually for medical appointments. It was disheartening at first however I try to remain positive as well because I have been able to do a lot of crafts while I have been here and have found some products that have helped me too. Some are what have already been suggested some are different. I would love to be able to write a blog post for you but i am not on twitter. This was shared on facebook. I am going to bookmark it and thanks for writing a wonderful post!